Exhibition Space, Level 4 of the National Library of Latvia. The Latvian Centre for Contemporary Art is the largest institution of contemporary art in Latvia, curating and producing contemporary art events of international and national scale. Since 1993, it has studied and shaped contemporary art processes both in Latvia and abroad in order to provoke critical reflection on contemporary societal issues. The hallmarks of the LCCA include the largest annual international contemporary art event in Latvia SURVIVAL KIT, exhibitions of contemporary art at the Latvian National Museum of Art, the Year of Hardijs Lediņš as well as Latvia's representation at such international events as Kochi-Muziris Biennale, Venice Art Biennale, São Paulo Biennial, Manifesta, Rauma Biennale of Contemporary Art and others. The LCCA holds the only archive of Latvian contemporary art. Having acquired her education in Saint Petersburg and Moscow during the revolution, Asja was not merely a passive witness to the “time of change”, but an active “pioneer” of avant-garde culture. Having completed her studies in 1918 in V. Bekhterev Psychoneurological Institute, she establishes an experimental children's theatre project in Oryol, also engaging street children, orphans and the homeless (besprizorniki), whose principles were later elaborated theoretically with the help of Walter Benjamin. In the late sixties and seventies, this text and the accounts of Asja's work experience became a “handbook” and point of reference for “Community Theatre” and alternative education as well as theatre experimenters in Germany, France and Italy. In these countries the method of improvisation she outlined remains in use. Asja's early work also influenced the basic principles of B. Brecht's "Learning-plays”, or Lehrstücke. She collaborated with Brecht as actress and assistant director already in 1923 in Munich. Influenced by Piscator's political theatre and Brecht's early experiments as well as her experiences in Russia, Asja Lācis in Riga became the director and main theoretician of the trade union theatre or Vajātais Teātris [The Persecuted Theatre]. In the early twenties, her reflections on German, French theatre as well as theoretical articles were published in the local press. Asja actively collaborated with the progressive leftist authors of her time, Andrejs Kurcijs, Leons Paegle and Linards Laicens , who published the collection of poetry Ho-Tai dedicated to her, also dedicating other pieces of poetry and non-fiction. After moving to Moscow, Lācis was among the first to become interested in the effect of the repertoire of children's cinema and the media on young audiences. Following a successful debut and work in the Latvian theatre in Moscow Skatuve [Stage], in 1938 Lācis became a victim of Stalin's repressions and was sent to forced labour camps in Dolinka and Burma. During imprisonment she managed to establish and head imprisoned women's theatre company. Only after Anna Lāce's death in 1979 German philosopher Walter Benjamin's Moscow Diary is finally published. This collection as well as the tendentiously negative articles of several people close to Benjamin create the stereotype of Asja as a sort of femme fatale, who turned him to Marxism. This reductive perspective continues to overshadow her significant contribution to culture. In recent years, thanks to the work of several Western and local researchers, feminist, theatre and art theoreticians, the creative legacy of Asja Lācis is being actively re-evaluated. 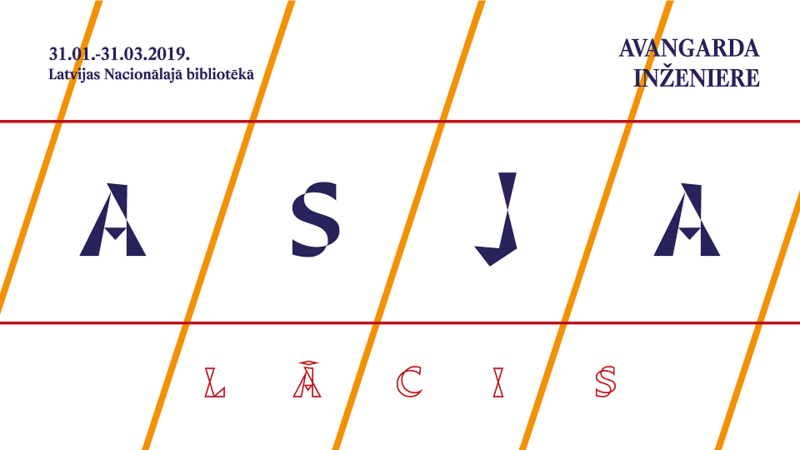 The exhibition Asja Lācis. Engineer of the Avant-garde aims to continue this important task in Latvia.